The team of the Archaeology and Cultural Heritage (ARCH) section has been participating in numerous short and long term archaeological projects. Some indicative examples are hereunder presented. 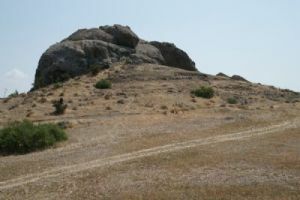 The application is related to a short-term, non-invasive field research project, relative to the identification of traces of ancient copper slag in the wider area of Kataliondas-Kourvellos, in the lower Troodos foothills, as well as to the acquisition of the spectral signature of ancient slag. The project is under the direction of Dr. Julien Beck (director of the Swiss Kataliondas-Kourvellos excavation, University of Geneva) in collaboration to Cyprus University of Technology (CUT) and Prof. Bertrand Merminod from the École Polytechnique Fédérale de Lausanne (EPFL). In addition to that, a 3D model of the ancient theater was printed by “CUTing Edge” of Cyprus University of Technology. The model is now exposed to the local Museum of Kourion, serving for educational reasons, being at the same time extremely useful for visually impaired people. The general objective of the project included the development of a new methodology and framework for monitoring Cultural Heritage Sites and Monuments of a wider area. Integrating to the traditional site observation practice, in which the coverage is limited, the methodology developed for the needs of the present project, put together both satellite and ground innovative technologies (such as satellite images, LIDAR sensor, GIS, sun-photometers etc), in an effort of a more complete and distant monitoring and management tool. Indeed, the project’s outcome can be described as a ‘forecasting tool’ for the protection and management of CH, endangered from anthropogenic and natural hazards. Such methodology can be integrated into the stakeholders decision-making process, so that preventative measures could be taken to reduce risks related to monuments. Furthermore, the proposal promotes sustainable development and protects CH using utterly non destructive methods. The research project was submitted and funded under the Framework Programme for Research, Technological Development and Innovation of the Research Promotion foundation and lasted for 2 years. ARCH team accomplished the mapping of the ancient cemeteries of Tilliria region. The project involved by the researches of the Lab, both archival and in situ survey. The collected data were introduced into a GIS environment for further analysis regarding the archaeo-landscape of Tilliria area. The project was conducted in collaboration with Kykkos Museum and the Department of Antiquities of Cyprus. The archaeological excavation at the site Avli in the village of Pano Pyrgos Tillirias, a collaboration beween the Department of Antiquities of Cyprus and Kykkos Museum, started on 2008 and is still going on following the sporadic excavation seasons. The ARCH section of the Lab was involved from the beginning of the project, for the documentation and GIS analysis of the site. The ARCH team in collaboration with the Department of Antiquities of Cyprus, was involved in the safeguard of the ancient cemetery in Sotira village, at the locality Mnimata ton Ellinon. During the first phase of the project the mapping of the ancient cemetery, as well as the individual tombs was accomplished. The second phase of the project, still on going, regards the architectural documentation of the excavated dromoi that lead to the tombs, as well as some of the visible facades of the tombs. An important archaeological excavation was initiated by the Department of Antiquities in 2012 (Director: Dr. D. Pilides) in the area of Ayios Sozomenos village. The ARCH team contribution is the development of the GIS of a wider area around Ayios Sozomenos excavations, in order to document the archaeological visibility of the area and to make the appropriate analysis in a landscape level. In the ICAROS project several technologies have been merged in order to create an innovative low altitude airborne system supporting remote sensing and photogrammetric applications. Amongst the various application case studies of the project was the use of copter to document archaeological sites in Cyprus. In collaboration with the church committee the ARCH section accomplished the detail documentation of the monastery including both the church and the underground tomb of saint Hrakleidios. Both laser scanner and photogrammetric techniques were applied. UAV flights over Palaepaphos landscape (Coordinator: Prof. M. Iacovou) were applied in an effort of updating the existing topographical information. Further more, the documentation and 3D model at the end of each excavation season are being progressed. Systematic observation both satellite and terrestrial of specific areas in Paphos town have been effectuated within the last years. The target is the detection and mapping of still unexcavated or reburied archaeological remains. As an outcome of the project a dramatic reduction of the visibility regarding buried remains was observed within the last 30 years, mainly due to change of land use. A collaboration between FORTH, EFA and CUT led to the 3 dimensional documentation of the palatial complex at Malia site in Crete, Greece. The site had urgently to be documented in order to be reburied for protection. The laser scanning of the site led to an extremely detailed documentation of each architectural element and its components.